Alvechurch villagers now have a place to take their problems thanks to a joint venture between police and local authorities. 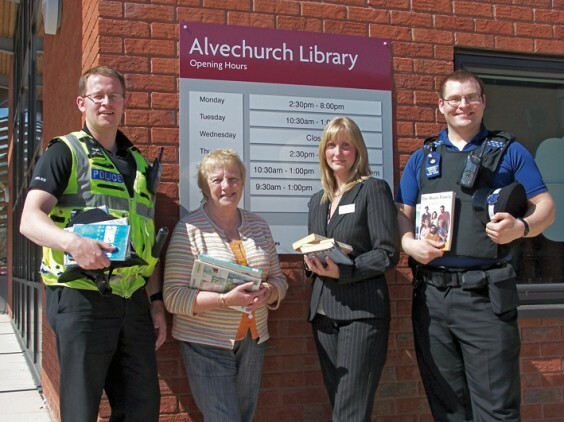 “Surgeries” are being held each Thursday afternoon at Alvechurch Library, organised by the Local Policing Team, Bromsgrove District Council and Bromsgrove District Housing Trust. The surgeries, which run from 2pm-5pm are designed to give local people an opportunity to raise problems directly on a wide range of issues. A police surgery starts the initiative on May 7 and the policing team will hold future surgeries at the library on the first Thursday of each month. Bromsgrove District Housing Trust will take the second Thursday in every month from May 14 and Bromsgrove District Council will hold a surgery there on the last Thursday of the month. It is intended that the remaining monthly slot will be taken by an organisation from the voluntary sector. The police surgeries will be run by Local Policing Officer for Alvechurch and Wythall, PC Lucy Thornton, and Community Support Officer Mark Hyder. PC Thornton said: “From our perspective these surgeries will help us to meet our obligations under the new Policing Pledge in terms of consulting and engaging with the community. “Thursday afternoons are traditionally very busy at the library and this will be the perfect opportunity for people to raise any problems they have directly with us and the other authorities here on site. The Alvechurch and Wythall Local Policing Team can be contacted on 0300 333 3000. Pictured above are local Policing Sergeant Ben Hembury, District Councillor June Griffiths, Stephanie Jones, Communities First team leader from Bromsgrove District Housing Trust, and Community Support Officer Mark Hyder.